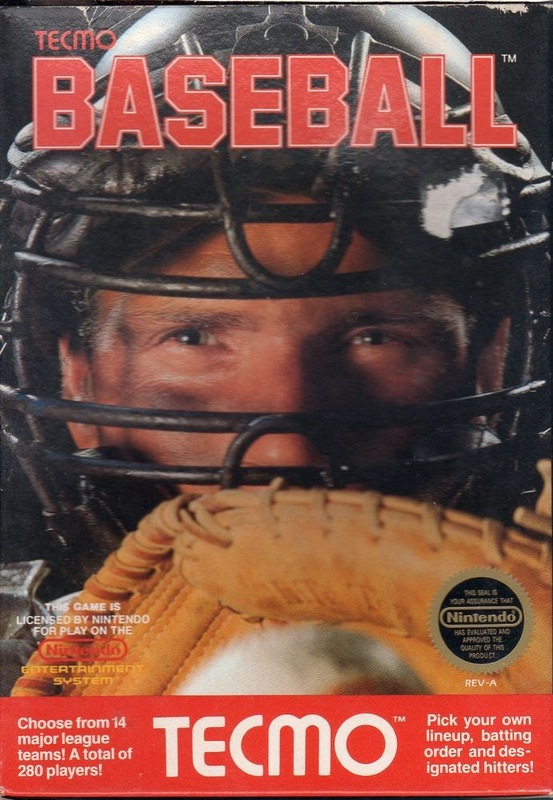 Tecmo Baseball is a game developed by Tecmo and released on the Nintendo Entertainment System (NES) in January of 1989. Tecmo Bowl, Tecmo's football game, on the NES was one of the best sports games for that console and I know I played it a lot as a kid. I honestly don't remember if I ever played this one, I just can't remember. Is it because I had played it and can't recall it now because it wasn't a very good game? Tecmo Baseball has three different modes to play, single player, one on one, and All-Star game. There is also a watch mode which I'm sure served some kind of purpose, I wouldn't buy a game just to watch it. There are two leagues, NM (Nation League), and AM (American League). 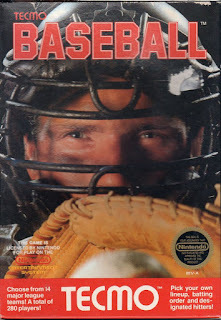 Tecmo didn't secure the rights from the MLB so everything is generic. Each league has seven teams which are listed by city, they don't even get fake names like Chicago Cyclops. The cities correspond with their real life team so the NM Chicago team is the Cubs and the player's stats are from the 1987 season. I would have been pretty mad to buy this game when it was new only to find out my favorite team isn't even in the game. Batting is simple, just swing when the ball gets to you. you can move the bat up or down to hit the ball at a better angle but I had a hard enough time just trying to make contact. I did manage to hit a home run in the bottom of the ninth with two outs, unfortunately, the one run wasn't going to help me at that point. On the mound, you press A to throw a pitch and use the d-pad to move the pitch location during travel. Holding down during your windup throws an off-speed pitch with pitch location working the same as with a fastball and you get a cool sound effect as the pitch travels. Controlling players in the field isn't too bad but I had some trouble judging where the ball would land. It's worse in the outfield since it takes a while before the screen moves enough to show the fielder. All of the outfields move when you move any of them which does help when you can't see the player closest to the ball. I don't know why but when a grounder makes it into the outfield the speed it's rolling increases and will carry it to the outfield fence. The graphics in Tecmo Baseball aren't the best but they are definitely not the worst for the system which I think goes to Major League Baseball. The sprites for the pitcher and batter look pretty good but the on the field players look pretty bad and the scoreboard is pretty bland similar to Major League Baseball. The sound isn't too bad in this game. The ump says ball, strike, and out and it's easy to understand him. While the sounds effects are ok the music is pleasant enough and plays throughout the game and not just at the menu screen like in Major League Baseball. Overall I had a pretty good time playing this game. In a complete game I lost 8-1 and probably half the runs were scored because I misjudged a hit. I think with a little more practice I'd do much better. While the graphics and the game modes aren't very good the core game is good enough to recommend this game. I give Tecmo Baseball a 6 out of 10.